The orthotic is a diagnostic tool not a permanent solution. It may be tempting to want to stay with the orthotic for an indefinite period since it helps alleviate painful symptoms in a very short time. After your bite is stabilized, your symptoms are dramatically reduced and your teeth, muscles, jaw, and temporomandibular joints are functioning in harmony, you must next arrive at a decision on how to proceed for long-term management and to stay pain free. 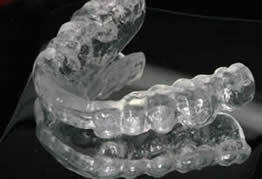 Orthodontics, (braces or Invisalign©), to move the teeth to this new ideal position. This option is typically chosen when there is limited restorative work in a patient’s mouth and the natural teeth are in excellent condition (not a bruxer). There will be a likelihood that you will need some Coronoplasty to adjust the bite to it’s optimal position. This option is the most comprehensive for function and aesthetics. This option allows us to restore all of the teeth in the appropriate Neuromuscular developed bite. This approach is mostly used when the patient has ground down their teeth so far that “height” will need to be added to the remaining teeth to bring their occlusion to it’s correct Neuromuscular position. The teeth are lengthened by the application of crowns and/or bridges to the remaining tooth structure. This permanently realigns the bite and provides the appropriate structural support for the jaw. Reconstruction gives Dr. Morgan the opportunity to conduct a complete smile makeover where your jaw will be in its appropriate position and you will have a beautiful smile. After recording and analyzing all of the diagnostic information compiled from the K7, you will return to the office for your first stage of treatment (3rd visit). Here is where we stabilize your bite in the correct Neuromuscular position. For most patients, the first step is to stabilize the bite by creating a custom Orthotic appliance to be worn on the teeth so your teeth fit together in the correct Neuromuscular position. The orthotic is custom made for each individual patient, based on the statistical data derived from molds of the teeth and the tests recorded on the K7. When the jaws are aligned correctly, the surrounding muscles, jaw and joints can operate in harmony, relieving them of stress, strain and pain. 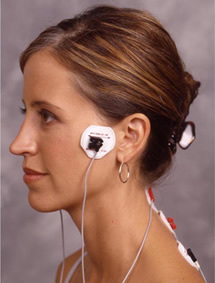 Most patients feel relief within the first several weeks. Wearing the orthotic trains or reprograms the muscles to go to their ideal position. Since the muscles have been tense for such a long period of time, it may take a little while for them to relax into a comfortable position. It usually takes about three months to stabilize the bite and ensure that their symptoms are gone. Once symptoms are relieved and the bite has been stabilized, Dr. Morgan will move on to the next step to permanently stabilize your bite to the correct position. 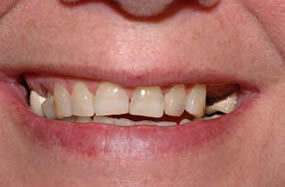 Worn or chipped teeth is by far one of the most common symptoms of clenching or grinding of teeth. Teeth are very strong, however, when there is chronic grinding and clenching, the enamel on the teeth will wear away. Most patients are not even aware that they grind their teeth, as most patients grind while they sleep. A properly trained Neuromuscular dentist can examine the teeth and identify if grinding is related to your chipped or worn teeth. They can identify and correct the cause of your grinding. If you see that your teeth look ground down, or you find yourself clenching your teeth, contact Dr. Morgan for a consultation right away. The tooth structure that you loose can only be replaced aesthetically with porcelain restorations. Dr. Carol F. Morgan, DDS, can help with worn or chipped teeth associated with TMJ disorders whether you live in Virginia Beach, Norfolk, Portsmouth, Chesapeake, Hampton, Newport News, York County, Williamsburg, or any other surrounding city in Hampton Roads. There is no question that chronic pain very commonly causes symptoms of depression. Nobody likes to be in pain and unfortunately nobody like to be around somebody who suffers from chronic pain. Patients who suffer from depression many times have problems with their families at home. We commonly hear from a patient’s spouse how the depression affects the home life. There is an unfortunate amount of people who suffer from TMJ that also suffer from depression. The depression so commonly is misdiagnosed or dismissed as having no physical cause. There is also scientific evidence that shows that patients with chronic pain, a condition that nearly all TMJ patients can claim, have chemical changes in the brain as a result of the pain. If the depression is severe, many patients need to work with more that one specialist to return to optimal health. Many patients also work with a psychological counselor as well as a chiropractor or physician. Luckily, some patients experience complete relief from the care and treatment of their neuromuscular dentist and do not need the multi-disciplinary approach. Your Neuromuscular Dentist can discuss the many options for treatment that you have. Dr. Carol F. Morgan, DDS, can help your problems associated with TMJ disorders whether you live in Virginia Beach, Norfolk, Portsmouth, Chesapeake, Hampton, Newport News, York County, Williamsburg or any other surrounding city in Hampton Roads.